Was happy to know that my good friend of mine was able to join me for the premiere screening of Monsters University last week. Sorry for the late reply as I was pretty much loaded with my office work and I did not even have much time to sleep. This time, Nuffnang had their screening at MBO Cinema, Citta Mall. I have been to Citta Mall once with my cousin last year and this will be my first time watching the movie at Citta Mall. The environment here is a bit quiet but their interior designs of the cinema totally caught my attention. 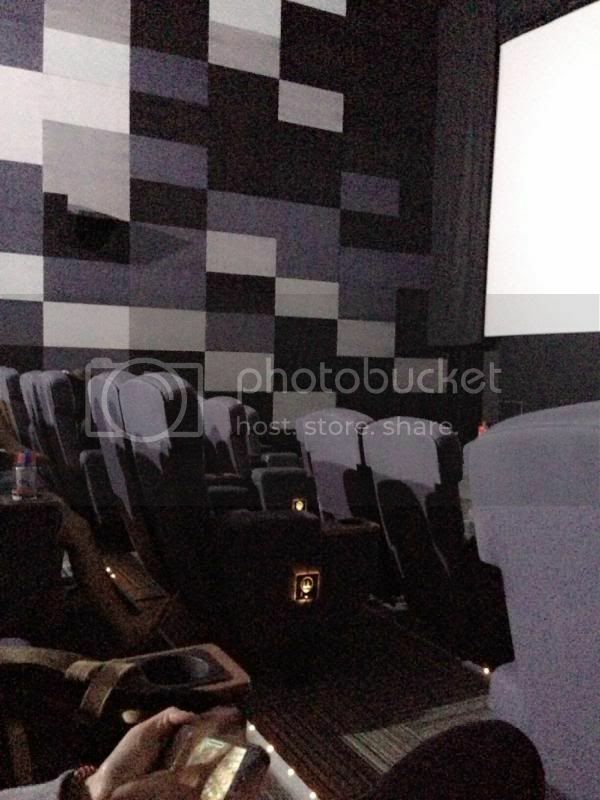 I remembered the MBO Cinemas' designs that I went before weren't that awesome compared to this. Michael "Mike" Wazowski has dreamed of attending the prestigious Monsters University. His dream comes true to become the college freshman. Mike is excited to finally enter, and begins majoring in scaring. On his first day, Mike befriends the nerdy and shy Randall "Randy" Boggs, who desires to be popular and has difficulty controlling his camouflage power. While studying scaring one night, Mike encounters an arrogant, playful, all-brawn, large blue monster named James P. "Sulley" Sullivan, who is in the same dorm as he and breaks into Mike's room to hide a Scare Pig named Archie, who is the mascot of rival college, Fear Tech. After greeting each other, Archie steals Mike's hat and he and Sulley follow Archie outside where they have a struggle to capture Archie. When they do catch Archie, Sulley is invited to join Roar Omega Roar, the top fraternity on campus. Mike tries to join, but an argument with Sulley leads a rivalry between the two. While the duo compete to see who's the better scarer for part of the semester, Dean Hardscrabble, the stern headmistress of the MU scaring program, says to the students in Professor Knight's class that an exam will be given at the end of the semester, with the ones who failed being forced out of the scaring program. Eventually, Mike and Sulley's petty competition gets out of hand and causes a mistake that Dean Hardscrabble expels them from the program and also results in Sulley getting kicked off his fraternity. Sulley and others have a hard time believing that Mike could be a good scarer. Mike finds out that Dean Hardscrabble will probably let him rejoin the program if he joins a fraternity competing in the upcoming Scare Games, a series of physical challenges that tests a monster's scaring ability. However, he is ostracized by all the fraternities. But hope arises when he joins Oozma Kappa, a group of misfit monsters; consisting of founder and mature student Don Carlton, nervous and shy Scott "Squishy" Squibbles, free-spirited and eccentric Art, and bickering siblings Terri Perry and Terry Perry, who share the same body. Oozma Kappa procees to the next rounds as a result of Mike's training, surprising everyone. During a party at ROR house, the ROR pranks Oozma Kappa and humiliates them in front of the whole university. Mike brings them to Monsters Inc. to lift their spirits where they are almost caught by Monstropolis authorities for trepassing. Feeling motivated, Oozma Kappa makes it to the final round against ROR. Even as the final round arrives, Sulley has a hard time believing Mike to be a good scarer. So in the final round, he manipulates the equipment so that Mike can register a good score and allow Oozma Kappa to win the tournament. When Mike realizes this, he is heartbroken and decides to prove to everyone that he is capable of being a good scarer. So, he ventures out into the human world while Sulley, feeling guilty, confesses to Dean Hardscrabble about the cheating. Mike arrives at a closet in a summer camp, but his plan goes wrong and he fails to scare the kids. Back in the university, the Dean has been notified that someone broke into the door lab. Realizing it is Mike, Sulley enters the door and arrives at the camp looking for Mike. At the camp, the police have arrived looking for intruders. Sulley finds Mike by the lake and they both run back to the camp to go back to the university. However, Dean Hardscrabble deactivates the door until the CDA arrives, trapping Mike and Sulley in the human world. Mike realizes that the only way to get back into the monster world is to generate enough scream energy to power the door. Working together, Sulley and Mike are able to scare the investigating adult humans to the point that they are able to make back through the door, which explodes from the strong burst of energy. 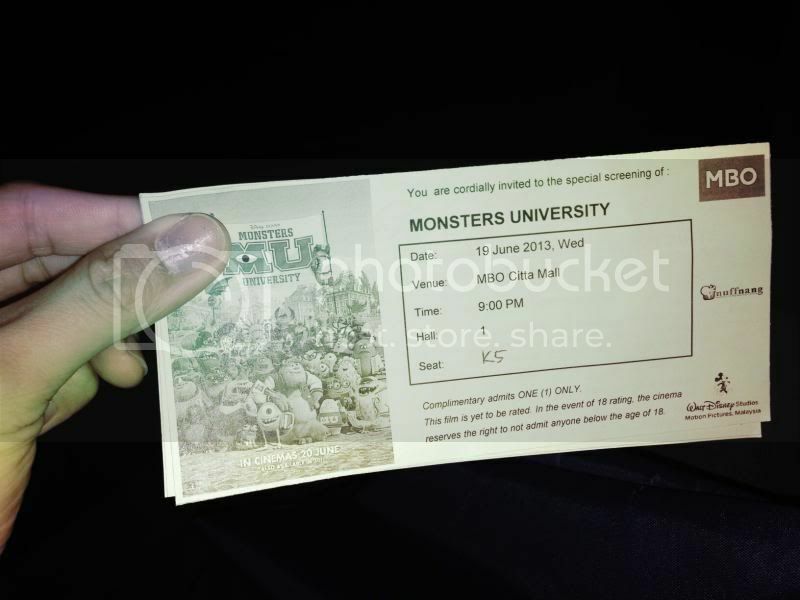 This causes Mike and Sulley to be detained by the CDA, thus expelling them from Monsters University. The movie ends showing that Mike and Sulley are employed at Monsters, Inc. as mailmen in the company's mailroom. I did not watch the previous sequel but I do find this movie a bit cute especially Mike. He works very hard in order to achieve what he wants. Rate of the movie: 3.0/5.